Each year, 15 million girls are married before the age of 18. The consequences of this practice are well known – child brides are at higher risk of domestic violence, are more likely to live in poverty, and are often deprived of an education. But that doesn’t stop it happening in countries all over the world. In fact, in more than 90 countries, the practice is not only culturally and socially accepted: it is written into the law . Until recently, that was the case in Tanzania. Not anymore. Thanks in large part to a petition put forward by Rebeca Gyumi , a World Economic Forum Global Shaper from the Dar es Salaam Hub , in July the country’s High Court ruled that the Marriage Act – which allowed girls as young as 14 to be married – was unconstitutional. We spoke with Rebeca to find out more about this landmark court ruling, and what other young change-makers can learn from her campaign. How bad was the situation in Tanzania when you decided to take action against child marriage? Tanzania has one of the world’s highest child marriage prevalence rates . 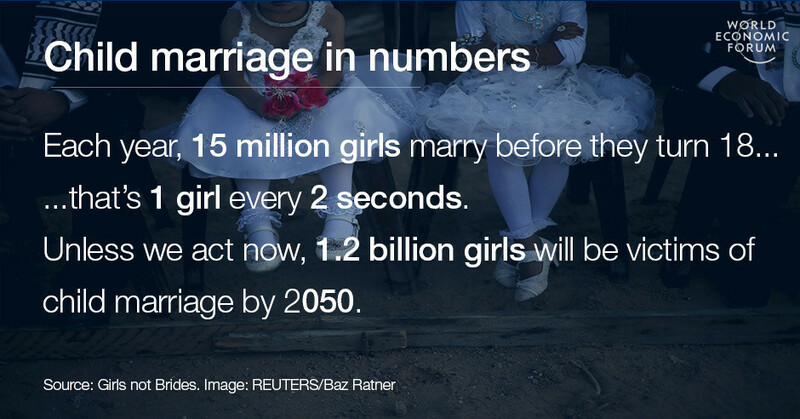 Here, almost two out of five girls are married before they turn 18. These girls are among the most vulnerable people in the country: they tend to be poor, live in rural areas, and have little in the way of formal education. This was in large part because of deep-rooted customs and traditions, as well as economic and religious factors. But it was also because the law allowed it. Our legal framework meant that girls as young as 14 could be married – although the same did not apply to boys, who had to be 18. How could we educate communities about refraining from harmful practices while the main piece of legislation that governs marital affairs in our country allowed children to be married? It was a huge contradiction, and one I was determined to fight. Tell us a bit about your journey to this landmark court ruling. When I founded the Msichana Initiative , an advocacy organization, one of our fundamental questions was how we were going to meaningfully contribute to the fight against child marriage in Tanzania. Over the years we’d seen many attempts made by both local and international organizations to change the law. All had failed. That’s why we decided to use a different strategy. We submitted a petition to challenge the validity of the Marriage Act – the act that meant girls could be married off at 14 – arguing that it was unconstitutional. We faced resistance along the way. The main obstacle I personally encountered was the attitude that young people are just trying to be disruptive, to challenge authority for the sake of it. As I reminded people, it is our duty as citizens to ensure our constitution is protected, and every person has the right to take legal action if they don’t think that is happening. It’s an attitude many other young people will have come across. You often have to go the extra mile to prove your intentions are honourable. So I did that: I read everything there was to on the issues so that whenever I was challenged, I had an answer and could demonstrate I was doing this for the right reasons. What has been the response in your country to this change of law? We’ve received mixed reactions. The majority of people celebrate it as an important step in safeguarding the rights of girls in Tanzania. But I have come across others who feel this decision goes against their cultural and religious beliefs. For some families with girls who are not in school, they still feel the best way to protect them is to marry them off. And what about the reaction in your Shapers Hub? My fellow Shapers at the Hub in Dar es Salaam have been with us from the beginning – in fact my advocate at the High Court, Jebra Kambole, is also a Shaper. At each monthly Shapers meeting, it was uplifting to receive feedback, moral support and guidance. To us, the Dar es Salaam Global Shapers Hub is not just a community: it's family. What can others campaigning to end child marriage learn from your success? That sometimes to bring about change, we need to think outside the box. If one approach is not bringing the results you want, do something different. Perhaps the most important thing, though, is to remember that government and the community are the biggest stakeholders when it comes to this issue – it is imperative that we continue working with them if we want to have a positive and long-term impact. You helped bring about a change in the law. But now is arguably the harder part: changing deeply ingrained cultural attitudes. How do you think that can be done? Bringing about social change is a process, a process that requires a holistic approach involving all members of society: parents, religious leaders, community leaders, government, civil society and young people. We need to continue working with all these groups to educate them about the effects of child marriage. It’s not an easy task to create change, especially when it involves changing a practice that is rooted in the customs and traditions of a community. But if we all commit to making this happen, we’ll succeed. The Msichana Initiative’s goal is “to create a society with empowered girls”. What will you work on next to make this a reality? We are already working on projects to enhance the importance of education and the power it has in transforming girls’ lives. We’ve launched a menstrual hygiene management education, which aims to decrease absenteeism by providing girls with proper information on how to manage their periods with dignity and make their own pads. We are also piloting Msichana Clubs in Dar es Salaam, which will be safe spaces for girls to learn about their sexual and reproductive health and rights. All the projects we’re running are grounded in the belief that we need to help girls achieve their full potential, and that involves education. Girls should aspire to be more than just wives and mothers: they can be doctors, lawyers, artists or designers, for example. But they can only do that with an education. 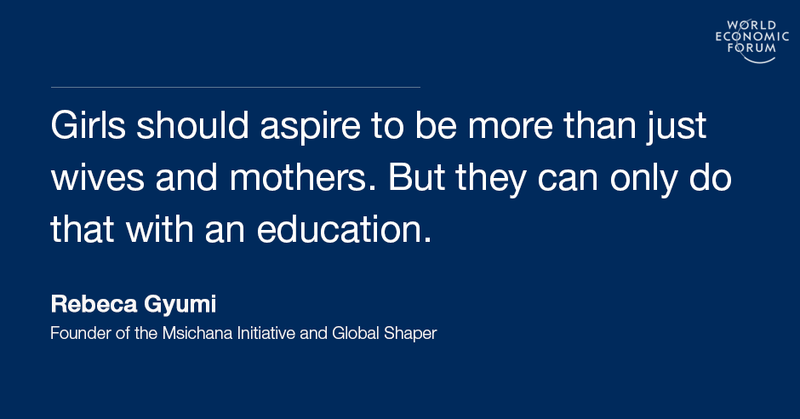 Finally: some advice for other young people who want to change the world? Stay true to your cause. Sometimes it might seem like you are fighting a losing battle, but don’t lose hope. Commitment and dedication are the best tools for reaching your desired outcome.